Mrs. V tagged me to share 7 random things you probably don't know about me! 1. My favorite animal is the tapir. I actually like tapirs so much I've done at least two projects in college involving them. 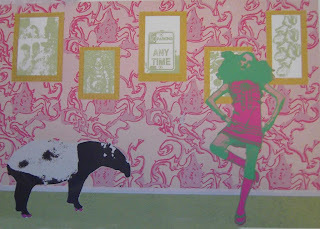 Including the screen print shown, entitled "Isadora and her pet tapir Crystal"
3. I have some crazy laughs. Some are really loud and one of them actually sounds like a quack according to some people. I've had friends try and coax it out of be before! 4. More than a year ago me and several friends created a zine called "Ink Engine". We made 100 copies and sold it at a zine fest. Wish we could get organized and do issue two! They are also being sold in a few local stores, yay for pushiness! 5. I'm about as obsessed with dvds as I am with books. Which pretty much reveals that yes I am a packrat! 6. I have a degree in graphic design and a minor in photography. 7. I love those little sponges that start out as pill shaped and dissolve into little sponges! Ok that was really random!!!! I'm going to tag: Hope's Bookshelf, Shooting Stars Mag, S. Krishna's Books, Reviewer X, and Diary of An Eccentric. Everyone else feel free to play along too!!! OMG! I have a really loud laugh that has to be toned down in public. bermuadonion- Thanks! I think my aunt was left handed but was forced to become right handed. I think it must have skipped a few generations! That's so cute about your dog! steph- Hehe, I hope you do it! J. Kaye- Haha, I tend to always cover my mouth afterwards or say sorry, it's so loud!! I've been doing it a lot lately watching tv, and my sister is like "What the heck is wrong with you!" A tapir! Wow, I never would have thought about a tapir! I often have loud laughs...Anna's sister has a great one. we should record it some time, though anna can imitate it well. Serena- I love tapirs! They just make me instantly happy, they are so cute! Haha, people love to imitate my laughs!